Many city drinking water systems add softening agents to keep plumbing free of pipe-clogging mineral buildup. According to new research, these additives may amplify the risk of pathogen release into drinking water by weakening the grip that bacteria – like those responsible for Legionnaires’ disease – have on pipe interiors. Biofilms, which are similar to the films that grow on the glass of fish tanks, are present in almost all plumbing systems and anchor themselves to mineral scale buildups in pipes. They are teeming with harmless microbial life and incidents of waterborne illness are rare. A recent study by co-author and civil and environmental engineeringprofessor Wen-Tso Liu has shown that even with the addition of antimicrobial agents by water companies, the bacteria that grow on the mineral scale can reproduce to harmful levels in supplies that stagnate within indoor plumbing. In a new study published in the journal Biofilms and Microbiomes, a team of University of Illinois engineers shows that the addition of anti-scalant chemicals cause the biofilms to grow thicker and become softer. The team measured the thickness and stiffness of lab-grown biofilms using magnetomotive optical coherence elastography – a tool used to measure the strength of cancer tissues. The analytical method, developed by Stephen Boppart, a professor of electrical and computer engineering and study co-author, allowed the team to quantify the effect that polyphosphate has on the strength of biofilms. To reproduce what happens in engineered plumbing systems, the team used PVC pipe and groundwater from the Champaign-Urbana area source to grow biofilms. They set up multiple scenarios with and without added polyphosphates. All scenarios produced biofilms, but the system that used polyphosphates grew a much thicker and softer biofilms than the others, the researchers said. 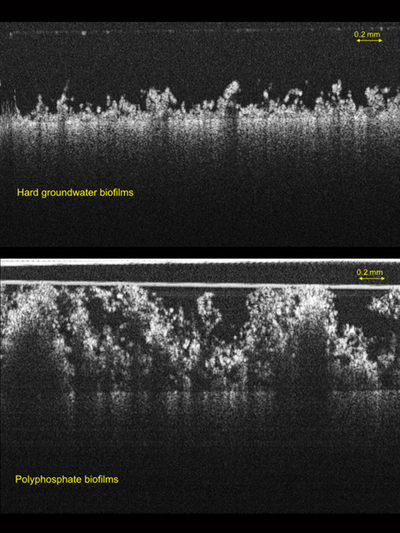 The top image shows a thin and stiff biofilm formed from untreated water, and the bottom image shows a thick and soft biofilm that formed as a result of polyphosphate treatment. Nguyen believes that the most affordable and realistic solution will come through a better understanding of water chemistry, not by trying to kill all microbes, ripping out pipes or changing regulations. “Before this work, we did not have a good understanding of the relationship between the water chemistry and microbiome that exists in plumbing. This work has given us initial insight and tools to help determine what chemicals will work best and at what concentration,” Nguyen said. The team is moving ahead with related studies that look at ways to help physically remove biofilms while pipes remain in place and others that look at the effects of anti-corrosive chemicals on biofilms and water quality. The U.S. EPA, the National Institute for Biomedical Imaging and Bioengineering and the National Institutes of Health supported this study. Former graduate student Yun Shen conducted the study as a part of her doctoral thesis. Was Our Moon Once Habitable? Does Dark Matter "Talk" with Ordinary Matter?